"Safety" is an important essense in the daily business in Hong Heng. On 18th July 2009, Hong Heng Iron Works conducted a safety Forum to show that the company is committed to "Safety" for the employees, the Client, the Environment, and the company. During this safety forum, all employees stop to engage in Safety sharing, training and a competition. Every employees took turns to share their experience in safety. From management, to supervisors and to general workers, all share their experience in their encounters and the importance of safety. The quickest way to response to an emergency is to have rescue team on hand. Hong Heng Iron Works has its own emergency response team. 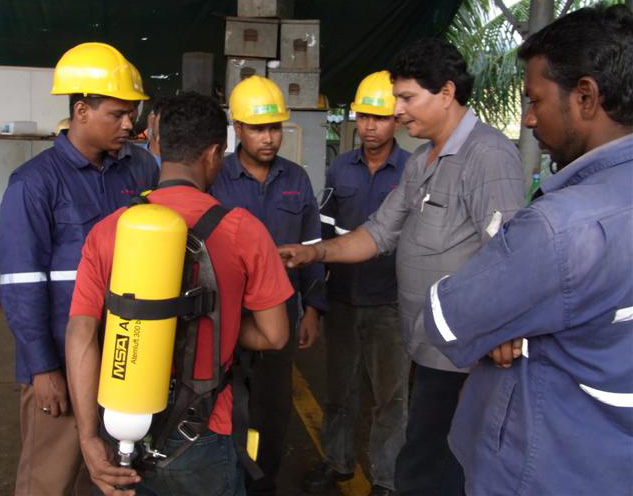 This safety forum also give all employees to familarize themselves with the use of the rescue equipment such as the Breathing Aparatus and the stretcher. Employees commitment and contribution are not overlooked. Hong Heng recognized performance. Two awards were given to the Best Performance Employee and the Best in Safety employee. Mr. Noyan receiving the Best In Safety Awards from the company Director. Mr. Shahin receiving the Best Performance Award from Mr. Chow. The company will continue this safety forum on a regular basis to ensure that safety is part of life for all employee of the company.